We’ve had a great number of decimal points in the Kingdom Hearts series to keep us fans going. But in reality, it’s been a long time coming for the 3rd instalment from Square Enix. So long I was personally unsure it would deliver, but I’m pleased to be proved wrong! My Kingdom Hearts 3 hands on session at EGX was nothing short of stunning. I played both the Olympus demo, taking on a Titan boss fight. Plus I took Sora into Andy’s room and checked out the adventure as a toy with Woody and Buzz. All of which was a fantastic example of what magic Kingdom Hearts 3 will deliver. Everything about my experience with Kingdom Hearts 3 just made me realise the wait will be worth it when this arrives on January 25, 2019 for both PlayStation 4 and Xbox One. While tempted to go straight to Toy Story, I wanted to see the Kingdom Hearts firework train first hand. 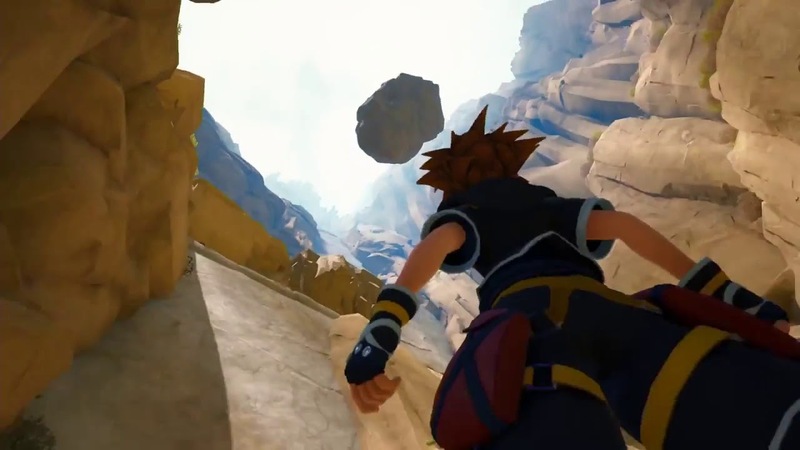 Right away I was running up the rocks with Sora followed by Donald Duck and Goofy. We scaled the mountain to the titan smashing down rocks on everything below, including us. All of which very intense. Soon I was into a battle with The Heartless and took my Keyblade for a spin. 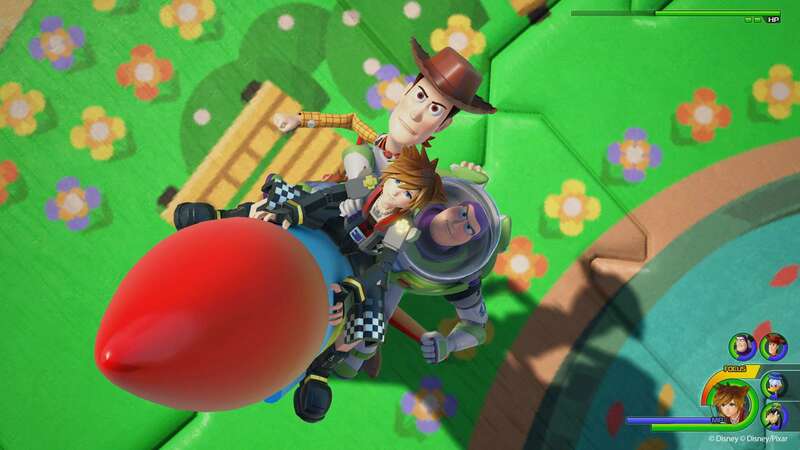 The first thing to say about Kingdom Hearts 3 is that the visuals that really are impressive. I was playing on a PS4 Pro at EGX and every pixel was just on point. It ran smoothly and the attention to detail on Sora and the Disney characters is brilliant. Gameplay wise it was back to that feeling fans of the series will be used to. 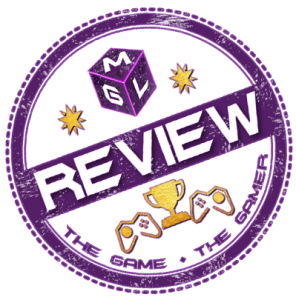 But, with added responsiveness and easy to use magic and special abilities to really take the series forward. The attack command menu is more there to show what you are doing. You do use it as before to activate different actions. But the “attack” command is more like a full action title this time. Moving to magic is speedy and activated in a flash. Then the option to use the special actions on triangle is where the game becomes even more special, however. All of them are fun, and the lighting effects on them are so impressive it’s hard not to be amazed at what you are doing. Speaking of which, the small enemies didn’t last long and I was up against the Titan. After smacking the big-guy’s feet for a while I was soon up onto his head. Then the moment came and I was on the firework train which worked perfectly in the setting. With the rock-formed titan and area around him being dark, the stunning light effects from the train jumped right off the screen. All the colours were so vibrant with that real neon-meets-pyrotechnic bust of light. Everything about that sequence is incredible, I had the biggest, cheesiest grin on my face too. But I don’t really mind, it was excellent. From the face buttons for attack, you go to traditional aiming and firing on triggers here to shoot fireworks. It felt really impactful to blast them at the head and fists of the Titan as it took swipes. It was really impressive, but there was more to come. 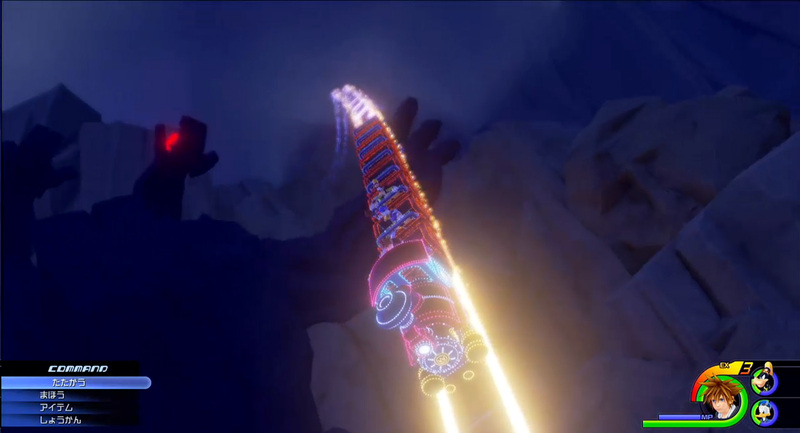 Let’s take a look at Toy Box… and hopefully get that Katy Perry song out of your head as we do. I then turned to the Toy Box demo where I could meet up with some of my favourite characters. Woody, Buzz, Rex and Hamm were all there and it was once again so well delivered visually. The fact that Sora, Goofy and Donald also appear as toys in this world just adds to the charm. I like it in the trailers, but I love to experience it first-hand. Here it was more about showcasing the story and the conversation with the characters. It’s clear now why they have taken so long over the game. Kingdom Hearts 3 is going for accuracy and detail in everything, especially getting the voice acting spot on. They’ve managed to get the true actors for many characters including John Ratzenberger as Hamm and Wallace Shawn as Rex. Where Buzz and Woody are played by impersonators, it was incredibly hard to tell the difference. More combat followed the story points and I was again fluidly taking on more Heartless with my Keyblade. This time I could unleash the tea-cup special ability and a rather giant toy hammer to squash them. Further in I jumped on a rocket with Buzz and Woody too which was a blast (sorry!). The big surprise then was heading out of the window and out into the street to take on more heartless so seamlessly. It was a very impressive feel of what Kingdom Hearts 3 will be like. I was finding it hard to believe Kingdom Hearts 3 would ever arrive at one point. Then I wondered if it could deliver the experience fans wanted when it did. Find out more about that and my impressions in the video above. But, now I’ve played it, I know this is going to be an excellent game. One that will be worth the wait. The visuals are stunning, the gameplay really is fast and fun. Plus the attention to detail with the Disney aspect is clear in every scene. Those special moves you can use and the worlds we’re going to visit have me very excited. Kingdom Hearts 3 was undoubtedly one of the best games at EGX this year, if not the best. It’s certainly my favourite. I really am convinced this could be one of the best games of 2019 as well. Will you be picking up Kingdom Hearts 3? After what I had to say in Kingdom Hearts 3 hands on preview, do you think you’ll be picking it up?